You all know Deep Steep is one of my favourite brands. I have worked my way through hand washes, shower gels, body oil, body mist and foot stick. The scents are gorgeous but recently I have gravitated towards Lavender Chamomile. Back in July I picked up the Sugar Scrub out of curiosity. Body scrubs are not my favourite products but I am mindful that my flaky skin needs attention and I am prepping for a holiday in the sun. I like that this scrub comes in a tube, much better than having to stick damp hands into a jar. It is also not swimming in oil but it does contain shea butter and coconut oil which helps soften the sugar and leave the skin with a silky moisturised feeling. If the oil feels too much on my skin I simply wash down with shower gel to help remove some residue. The sugar granules are large and scratchy but I am not finding it too harsh as long as I use it in the shower on damp skin. I think Deep Steep’s lavender scent is perfect. It is a soft and gentle fragrance but not overpowering or reminiscent of your Grandma. If you like body scrubs I am 100% certain you will like this product. I defy anyone to say otherwise, a bold statement but you can’t fault this brand. The ingredients are good, in fact really good considering the price tag. Fear not if you don’t adore lavender and chamomile as much as I do as the sugar scub is also available in grapefruit bergamot, passion fruit guava and brown sugar vanilla. 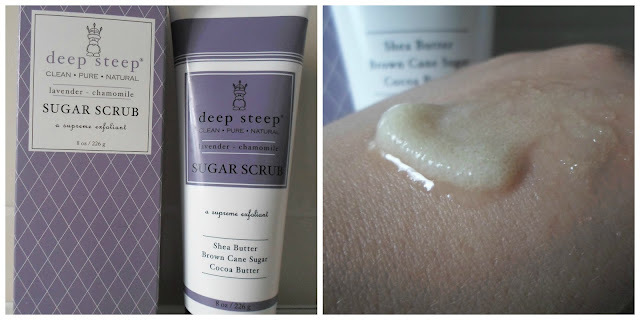 I satisfy my Deep Steep addiction via Feelunique.com and the sugar scrub currently retails for £9.95 (226g tube). Have you tried this Sugar Scrub? I think I love Deep Steep as much as you, and have read your blog posts about their products with great interest. I haven't tried this but will do since I like body scrubs. They have nice scents and I prefer the passionfruit guava and also tangerine melon. Thanks for this informative and lovely review. I really like Deep Steep products but have not tried their scrubs. Like you, I have very sensitive skin and patches of eczema so if I'm not careful scrubs can really bother my skin. I haven't purchased one in a long while for this reason, and instead mix a little dampened organic oatmeal (finely ground in the food processor) with my usual body wash whenever I need exfoliation. Unfortunately, that can get a bit messy. I'd love to find a pleasant-smelling alternative that I could use once a month or so. This just might be it!